This is ISS’s HDEV (High Definition Earth Viewing) experiment — a live HD stream from several cameras mounted to the External Payload Facility of the European Space Agency’s Columbus module, and has been broadcasting since April 30, 2014. To protect the cameras, they are encased in pressurized, temperature-controlled housing. 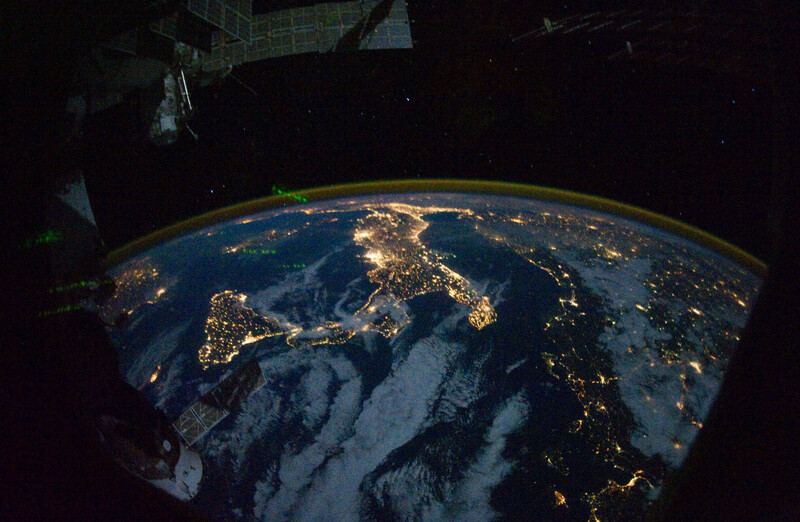 Viewing notes: A black screen is normal when the ISS is flying above parts of the Earth with no lights on the night side of the Earth (it orbits every 92 minutes, so in 30 minutes it will likely be over day again), and there is no sound to the stream. Although the black night view might not be interesting, I recommend you wait — when you see the crescent of the Earth and the red glow of the Sun appear, it is spectacular. There is also (rare) down-time — meaning there has been a loss of signal with the Earth or that HDEV is not operating: at these times, viewers will see a gray slate or previously recorded video. The live stream frequently switches between cameras — while the cameras switch, viewers will see a grey slate, then a black slate, before seeing the new camera angle. In the meantime — and relatedly — you can watch the course of ISS live on this other page. It will show you where the ISS is right now, superimposed over the Google Earth map, and you can watch it’s trail accumulate (it travels at 27,600 km/h [17,100 mp/h]). If you see something great on the live stream, take a screenshot and post it in the comments!